Good comparison of the relatively scarce low yielding Sercial variety here. As of 2010 just 20 hectares (49 acres) cultivated in north region up to 2500 feet altitude. High natural acidity is the key with intense expressive aromatics in a very dry style. Both browning in colour but 1937 with deeper tones. 1940 was released in the 1980s & bought by Andrew Jones at Christies auction in 1996 & 1998 at low market price of 24-25 GBP (now 300-400) but shows flatter style lacking purity with notes of caramel (added). Much prefer the 1937 vibrancy with nutty classy drier balanced power. 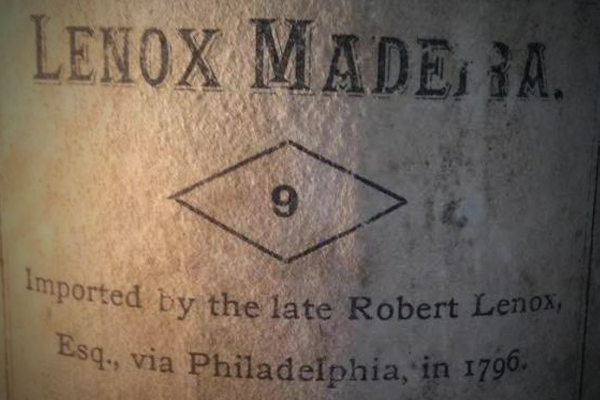 It should be noted this 1937 spent longer in cask because not bottled till 2003. 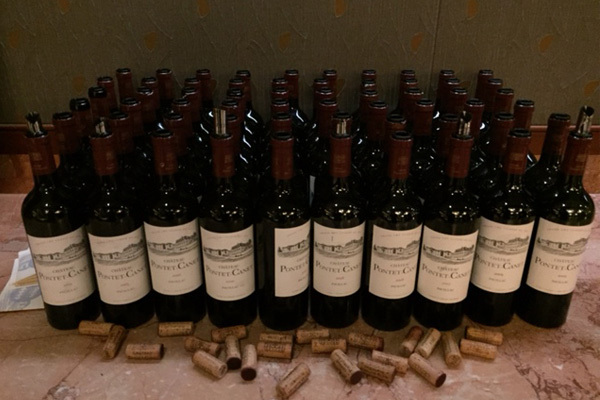 These wines had been stored standing up and were double decanted the weekend before by Andrew Jones as they need air to open up (and don’t oxidize further). 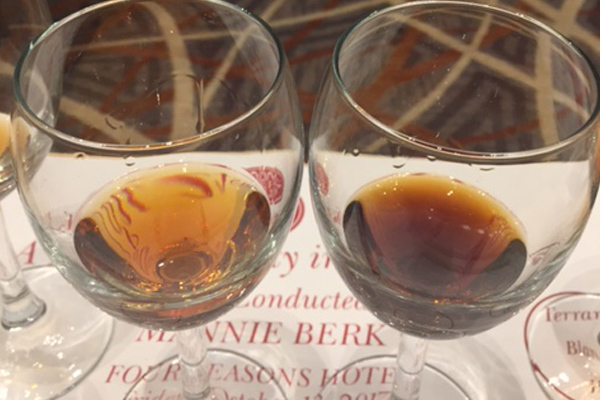 All Madeira wines were served at room temperature but Mannie Berk says some consumers do prefer Sercial slightly cooler. Excellent first pair. Good as an aperitif or with fish like smoked salmon. Once the most planted variety before phylloxera but as of 2010 now just 47 hectares (116 acres) mainly at lower altitudes on the north side. Early ripening low yielding with high acidity plus higher sugar levels for a medium-dry style varying from a dry-like Sercial to a sweeter Bual. 1986 was a great vintage from a shipper famous for their Verdelho bottled in 2017 showing richness balanced by strong acidity. The Solera from 1851 continued to be topped up by Cossart only until 1953 when sold in cask to Berry Bros and bottled in 1969 & 1973 (tried here). Bought for just over 4 British pounds but now 300 odd at auction. Both interesting with such a dramatic difference in their styles. Match nicely with a soup course. Bual (or Boal) is Malvasia Fina with about 20 hectares (49 acres) planted on the warmer south side of island. 100 years apart here and a big difference in their colour. Not what you normally expect where usually red wines get lighter with age. However with Madeira the longer time spent in barrel turns it into a much more concentrated darker red colour with that distinctive green-yellow rim. 1995 had 20 years but 9 were warm and 11 cool (which slows down that concentration) and looks quite light in comparison as shown in the photo. Amazing. Often 60 grams/litre residual sugar in Bual but not cloying sweet because of the very high acidity to balance it off. That 1895 bottle was really spectacularly complex! What a treat. Classics like 1920 Cossart Gordon were made from the historic Malvasia Candida but difficult to grow and now only 4 hectares are remaining. Now a newly bred grape Malvasia Branca de Sao Jorge introduced in late 1970s occupies 35 hectares (86 acres) being ideal for the sweetest Malmsey. Same shipper with their 20 year being the average age bottled in 2014 in a light elegant style with an emphasis on freshness selling for around $195. The 1954 is dark rich all butterscotch coffee mocha at $495. Was a delight served with the accompanying roasted nuts. Would be special with dessert. Once more widely planted but always a rare bird with special aromatics placed in a respected category. Extremely low yielding and high susceptibility to oidium with now only 2 hectares (5 acres) in total. Drier towards Sercial/Verdelho style but very fine quality served last. Surprising that the oldest 1960 bottled in 1992 with 32 years in cask while the youngest 1970 not bottled till 2016 so has 45 years barrel aging. 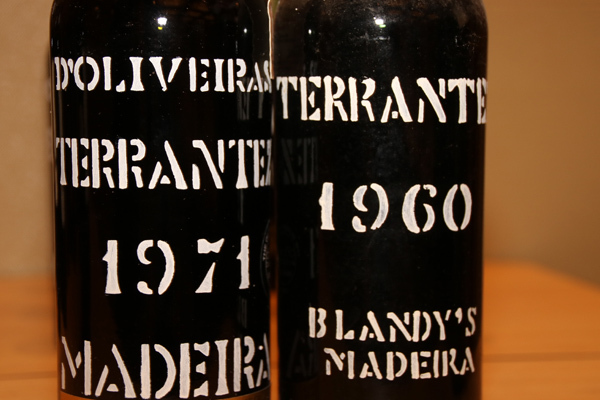 Aging process is the most important aspect of Madeira distinctiveness and prefer the younger 1971 with 13 more years in cask. They are quite similar though with both showing that unique sweet-bitter taste of Tarrantez that is so subtle and super elegant. Brought back nostalgic memories to this scribe about those marvellous 1792 & 1795 and other oldies from memorable tastings back in the mid 1980s. Many thanks to Mannie Berk and Andrew Jones for presenting such a wonderful world class tasting. So informative and so well done with rare bottles. IWFS are to be congratulated for the organization of and depth of these wine events. 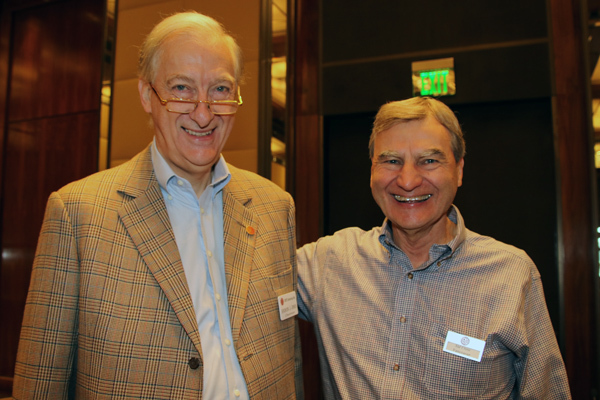 Encourage more members to attend upcoming future Great Wine Weekends & Festivals. If you are not a member you are missing out and should become one. 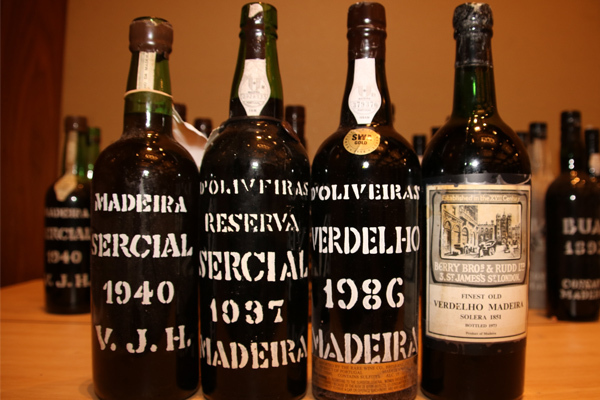 Have you tried an old memorable Madeira?